Heading into the last weeks of winter, the Colorado River Basin is dry yet again. Even worse, the river flow forecast gets drier every month. 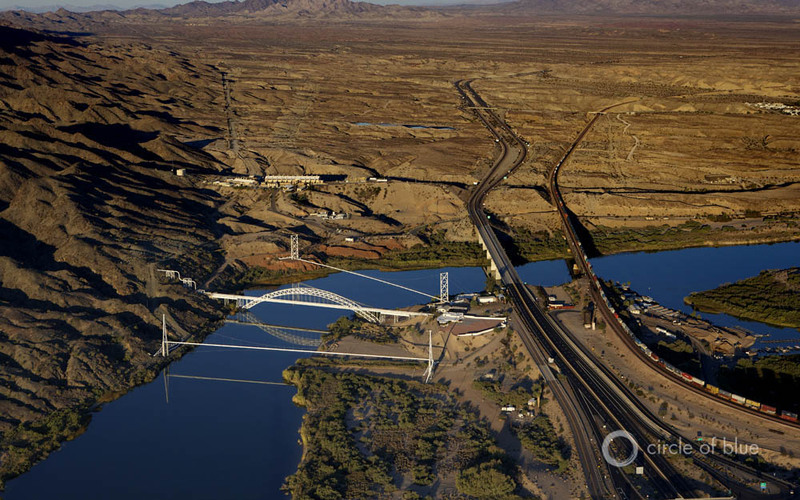 Interstate 40 crosses the Colorado River, near Needles, California. Click image to enlarge. The March forecast for the Colorado River Basin is a familiar tune: river flows will be below average in 2013, as they have been for ten of the last 13 years. Just 5.3 million acre-feet, less than half of normal, are forecasted to flow into Lake Powell in the 2013 water year, which ends September 30, according to the latest estimates from the Bureau of Reclamation. Inflows to Lake Powell, the basin’s second largest reservoir, last year were just 45 percent of the 30-year average. Low river flows affect both wildlife and the region’s recreation economy. The corresponding drop in lake levels also cuts the amount of hydroelectric power produced by the basin’s dams and strands marinas and boats. Yet water rationing would occur only when Lake Mead, downstream from Lake Powell, hits a certain level. That point, an elevation of 1,075 feet, has never been reached. Back in August 2012, when preliminary river flow forecasts are developed for the upcoming year, the Colorado Basin River Forecast Center said that the “most probable” scenario for the 2013 water year – in other words, the scenario that occurs half the time – would be an inflow to Lake Powell of 8.85 million acre-feet, or 82 percent of normal. The “minimum probable” inflow – or the scenario with a probability of 10 percent or less – was 5 million acre-feet, or 46 percent of average. As the months pass and the snowpack remains subpar, the river is nudging closer to that lower bar. The mid-February forecast from the Bureau of Reclamation pegged the water year 2013 inflows to Lake Powell at 5.375 million acre-feet, or 53 percent of normal. Now, the March forecast is even smaller. Regardless of how much water flows into Lake Powell, the Bureau is required under the basin’s operating rules to release at least 8.23 million acre-feet from the reservoir for downstream users. That means the reservoir will suffer a net loss of water and lake levels will drop. By the end of September, forecasts show Lake Powell plummeting 9.8 meters (32 feet) in a 12-month period, matching the drop in elevation it suffered the year before. If these forecasts hold, total reservoir storage on the Colorado River will be just 50 percent of capacity by the end of the water year in September, a level not seen since 2005, when Lake Powell dropped to record low levels.